I recently came to the realization that my house is completely out of order. It all started a couple of weeks ago when I completely forgot about a pair of tickets to see Ira Glass performing at the Smith Center. Those tickets weren’t cheap and I’d been looking forward to the show for months. The day of the show came and I spent the day baking cakes and making bolognese, totally oblivious to the date. Ten minutes before the show was to start, I found myself standing in the kitchen, dressed in flour-dusted sweats, staring in shock at the reminder on my phone. I have never completely forgotten an event like that! I felt like I was going to be sick. The next clue came when I found a long-forgotten medical bill under a pile of papers on my desk that I had set aside to investigate. But the straw that broke the horses’s back, was the Thing I Found in the Pantry. It was an unidentifiable mass in the bottom of the box where I keep the potatoes and onions. It had been in there quietly festering for Lord only knows how long. That’s when I realized that my house, which looks pretty tidy on the surface, was harboring a dark secret–lots and lots of clutter. I looked around and saw clutter cleverly tucked away behind closed closet doors and cabinets; clutter sitting in a pile on the desk; clutter in boxes in the pantry; shelves full to overflowing. How on earth did we end up with all this stuff? All that clutter was piling up in my brain, manifesting as forgotten tickets, late bills and scary blobs in the pantry. A friend of mine used to say when you learn a lesson that costs some hard-earned money, that you “bought yourself some sense”. Well, with the cost of those tickets, I bought myself some sense and now it’s time to tidy up. I am usually moved to reorganize in early January, right after the New Year, but I really didn’t have a spare moment between the holidays and launching full speed into planning our wedding. Last year I did a massive project to reorganize my disaster of a pantry so it’s kind of depressing that it is already out of hand a year later. It’s also frustrating to find myself doing the same reorganizing projects year after year, so what I was really looking for was a way to clean up this mess up once and for all. 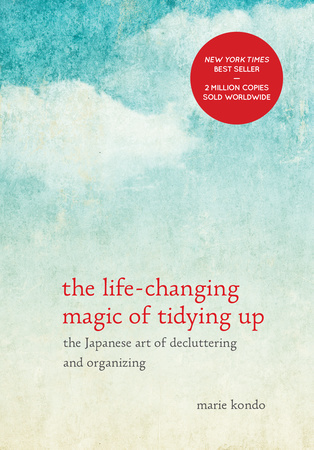 Fortunately, I stumbled across this perfectly inspirational (and aspirational) book, The Life Changing Magic of Tidying Up by Japanese organizing consultant, Marie Kondo. Have you heard of it? I was so intrigued by the author’s claim that I could tidy up my space once and never have to do it again, that I bought the book immediately and read it in one afternoon! The central premise of this small and easy to read book, is to surround yourself with only the things that “spark joy” when you hold it in your hands. The author’s “KonMari” method forces you to come to terms with each item that you own and assess how you feel about each piece, starting first with clothing, then moving in order onto books, papers, miscellany and lastly, things with sentimental value. Last weekend, I tackled my clothing. I took every piece of my clothing from all of the different parts of the house and piled them in the center of my bedroom and the sheer volume of my clothing took my breath away! I don’t think of myself as someone who has an extensive wardrobe and I am famous for staring into the abyss of my closet saying “I don’t have a thing to wear!” but this enormous, teetering pile of clothing was staggering. This is a terrible photo, but I wanted you to see what I started with. Determined to arrive at the calm, Zen spaces described in the book, I did my best to follow Marie Kondo’s method of picking up each piece, and asking myself if that piece of clothing “sparked joy”. Through this process, I learned that I had a closet full of clothes that didn’t spark joy–clothes I didn’t love, but purchased just because they were on clearance; clothing received as gifts that didn’t suit me, but I felt too guilty to discard. The book allowed me to let go of the guilt associated with discarding these items by helping me to acknowledge the item’s contribution to my life and to let it go with gratitude. I admit, the whole time I worried that I wouldn’t have anything left to wear. Seven bags of donated items later, I now have a small core wardrobe of my favorite things. I cheated a little bit. I still have one or two items that I haven’t parted with that don’t exactly bring me joy (I’m talking to you, pilly blue sweater!) but that I’ve convinced myself I still need. I expect I’ll get rid of those final few items in the near future as soon as I find something joy-inducing to replace them with! 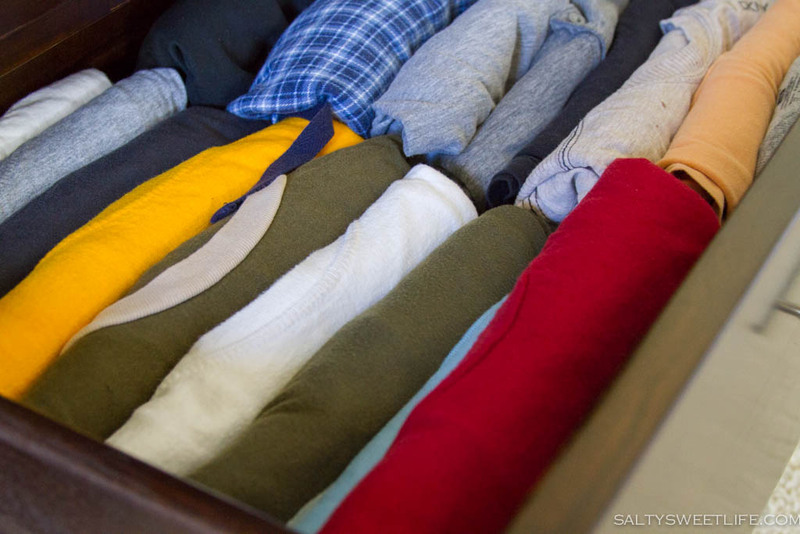 What made the biggest impact on me through this process was the author’s method for folding clothing to maximize drawer space. Each piece is folded into a simple rectangle and aligned in the drawer on edge like a filing system. Where has this method been all my life? I was able to save so much space in my dresser that I freed up an entire drawer for The Husband. I love this method so much, I’ve started folding everything in the house like this, including my kitchen linens! 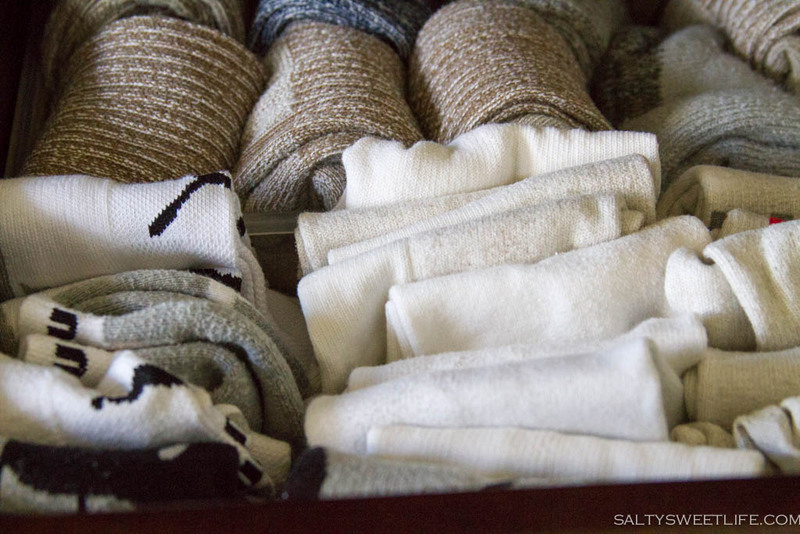 The socks and stockings stored in your drawer are essentially on holiday. They take a brutal beating in their daily work, trapped between your foot and your shoe, enduring pressure and friction to protect your precious feet. The time they spend in your drawer is their only chance to rest. But if they are folded over, balled up or tied, they are always in a state of tension. In short, if you ball up your socks or tie up your stockings, they wear out faster. The author’s anthropomorphism of these ordinary objects resonated with me as I imagined the poor socks stretched and tense in the drawer. I unbundled all the socks and carefully refolded them. I rolled my stockings and set them on end. They are now resting happily in the drawer. This is The Husband’s sock drawer. 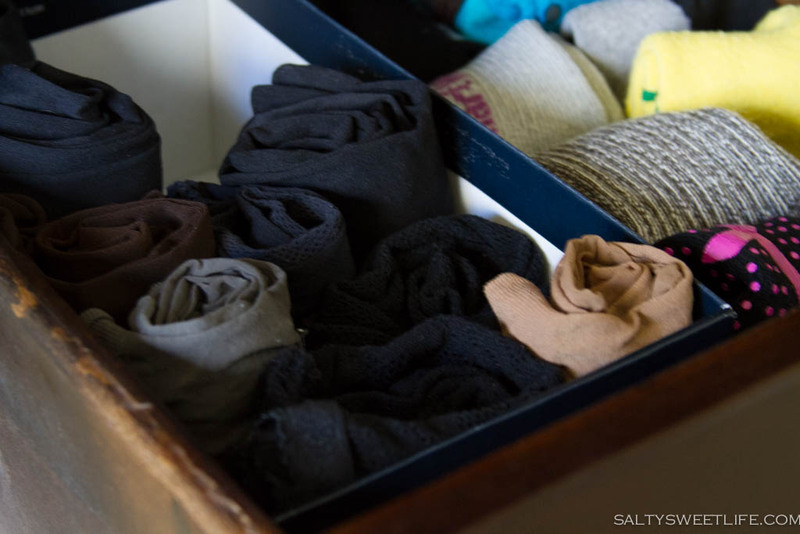 It’s chock-full because he hasn’t had a chance to declutter yet, but you can see how many socks can fit in the drawer now. I highly recommend the book. The message is so incredibly simple, yet it has forced me to come to terms with my tendency to hold onto items in my home that don’t fill me with joy. Yes, it’s hard to get rid of large amounts of “stuff” but if I only have to do this once and the end result is a clean, organized space like the ones shown in the video, then sign me up! It wasn’t just my brain that was feeling the effects of so much clutter, my gut was also suffering. I’ve had digestive problems over the years and most of the time I can keep it in check, but lately, my stomach has been on the warpath. Between holiday food, wedding food, football game snack food, my gut has been telling me that I haven’t been eating well at all. There were even days where I had to think hard to remember if I’d eaten any vegetables that day. So, along with tidying up my home I’m tidying up my diet as well. 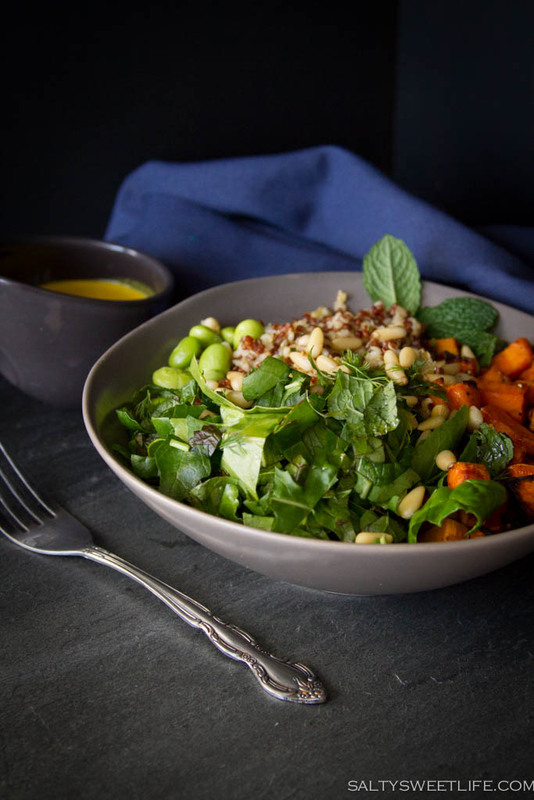 I was really inspired by an article in the February issue of Bon Appetit magazine describing how to make a stellar grain bowl and they have become our go-to meal lately. The method is so incredibly simple that you don’t really need a recipe at all. 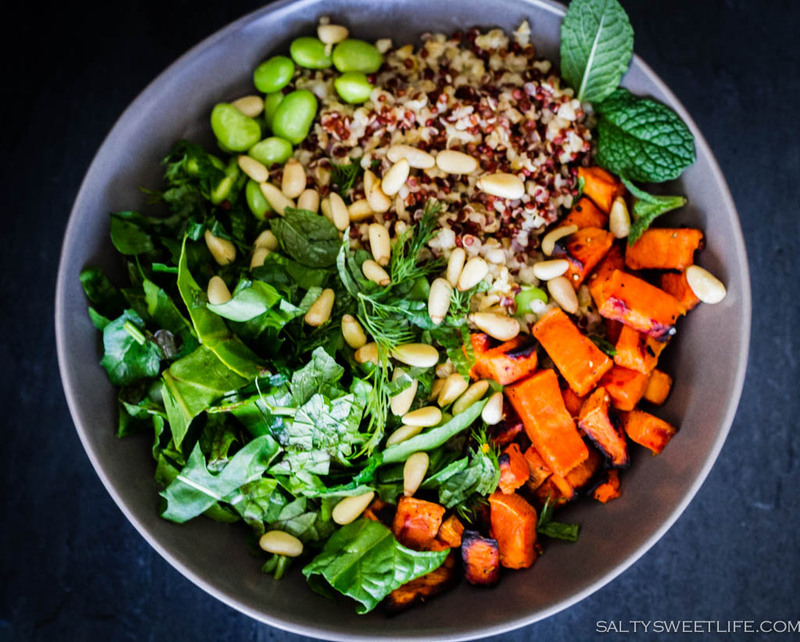 This isn’t so much a recipe as a blueprint for making your own grain bowl and the possibilities are endless. Start with a base of whole grains. I used a combination of freekeh and quinoa for this one. Add some leafy green vegetables. We have some collard and mustard greens in our garden that are coming to the end of their life cycle, so I sliced them thinly and added a splash of lemon juice to tenderize them along with some spinach, arugula and beet greens from our garden as well. You can also add a splash of apple cider vinegar for tenderizing hardier greens like collards or kale. Add roasted root vegetables for sweetness and color. 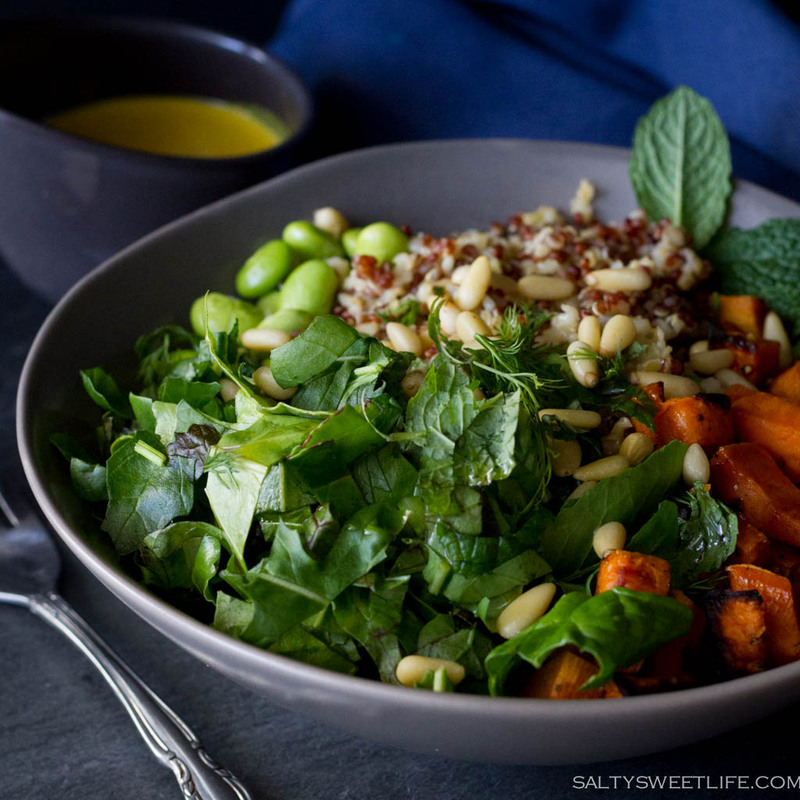 For our grain bowl, I roasted some cubed sweet potato in coconut oil. Toss in something crunchy. Toasted nuts, like pine nuts or walnuts are a delicious addition. Also consider adding seeds, like fennel or sesame seeds. Top it all off with a zippy dressing. 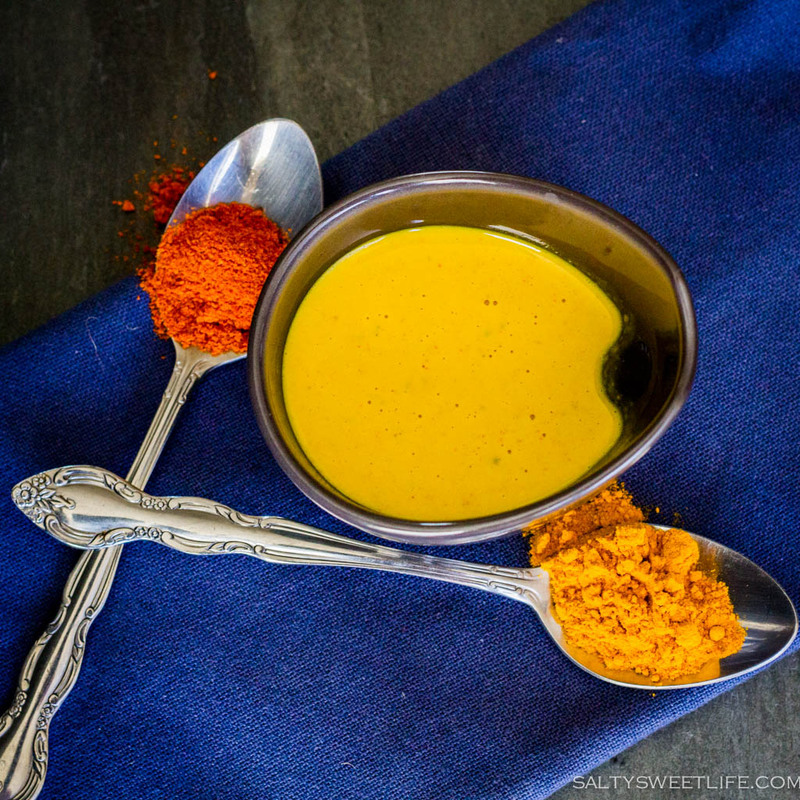 This bright and sunny tahini dressing is almost exactly the same as the tahini sauce I shared last week, but with the addition of turmeric and cayenne pepper which gives it a perfect dose of heat. 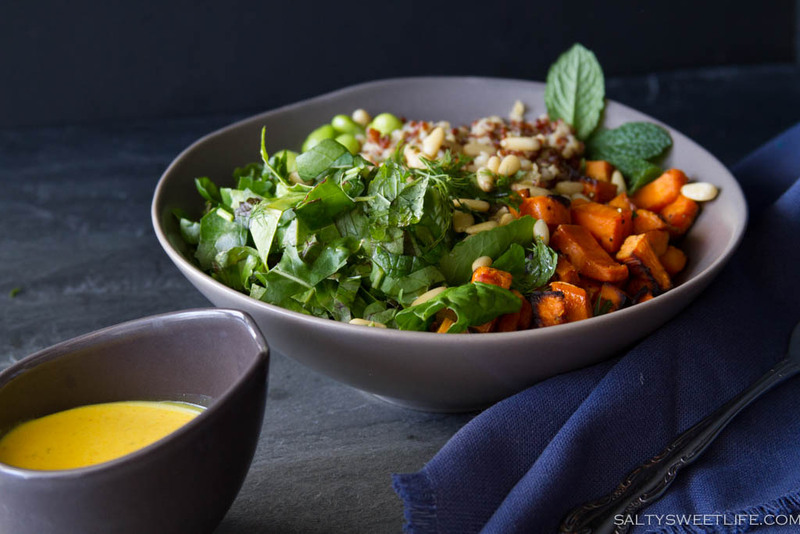 What I ended with was a grain bowl that definitely “sparked joy” in my stomach–bright and colorful, with a little crunch. My body thanked me for giving it something healthy and filling. I have a long way to go with this decluttering project and my next project will be tackling our bookshelves, which are currently filled to overflowing. I’ll keep you updated on my progress! Thank you Julie! That is one of the points in the book–dealing with things that get passed around in families. I will add that this method works a lot better for single people. It’s hard to declutter only my things, but I can’t do the decluttering for The Husband. It’s such a personal process. I hope I can get all of this done soon, but I have a feeling it’s going to take me a while! And then….it’s time to start over. Grainy salads make for happy tummy’s! This is also part of the reason for my current salad craze. 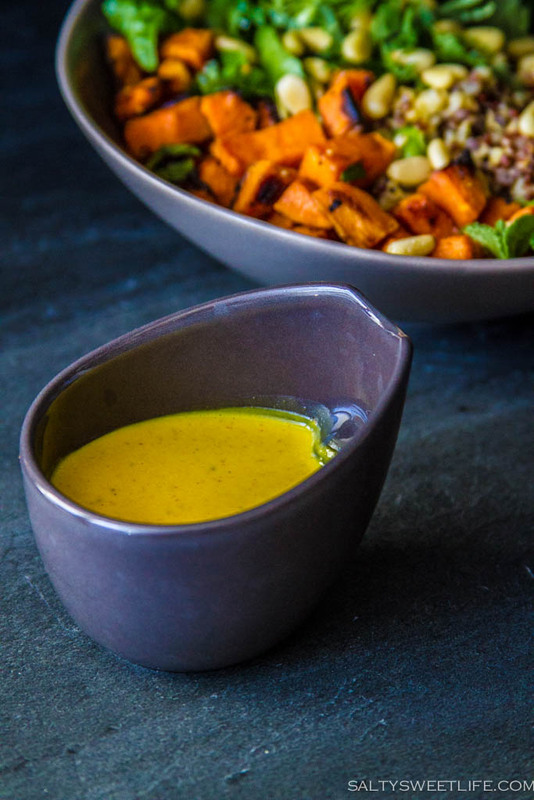 Love the look of that golden tahini and turmeric dressing. Yes, indeed! My tummy thanks me every time I eat well. I ate a lot of rich foods over the holidays–now it’s time to reign in the diet! You could build a fort out of all those clothes haha. But you instead did a magnificient job getting them under control. Beautiful pictures too, I Loooove Edamame. Thank you Dana! And that was only half of the pile! It is a work in progress for sure! Purge. Purge. Purge. I’m all about purging closets, sheds, attics, and so fourth these days! You really got rid of a lot f clothes Tracey, and this dish looks incredible! Christina! 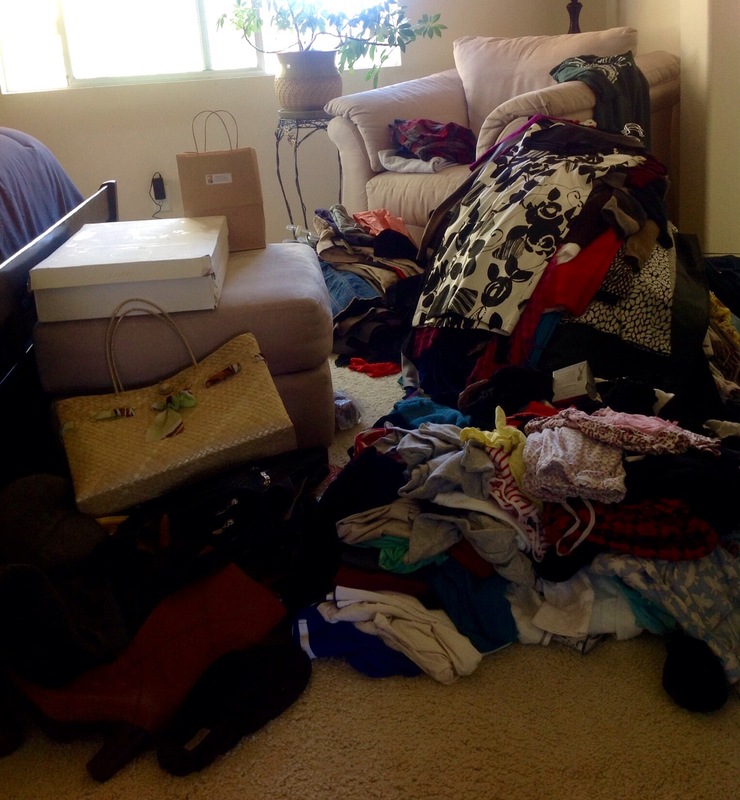 I have been on a roll with the decluttering process! Unfortunately, I’m terrible about taking “before” shots–they are so embarrassing! But so far, so good–things are getting cleaned up around here! Thank you so much! Thanks for stopping by, Lily! Yay–so glad it motivated you and you are welcome! Spring cleaning is right around the corner! Oh my goodness, we are the same person. I just listened to a podcast (Art of Simple) that interviewed the guy behind the blog Becoming Minimalist and was SO INSPIRED. Eric and I have started this massive purge of our house; basically de-cluttering instead of (constantly) reorganizing. Way to go with your closet! And these grain bowls? Ever since I read about the “blueprint” in a magazine last summer, this has been my lunch basically every day! Yum! Hi Liz!! Thanks so much for popping in! So, here’s a funny thing, my husband is named Eric, too! I feel so much more calm after having decluttered. My space isn’t close to “minimalist” and I didn’t go “full Kondo” on every single item, but it’s so much better than it was before. I have no idea how we acquired so much stuff! I’m going to check out that podcast, also–it sounds like a good one! 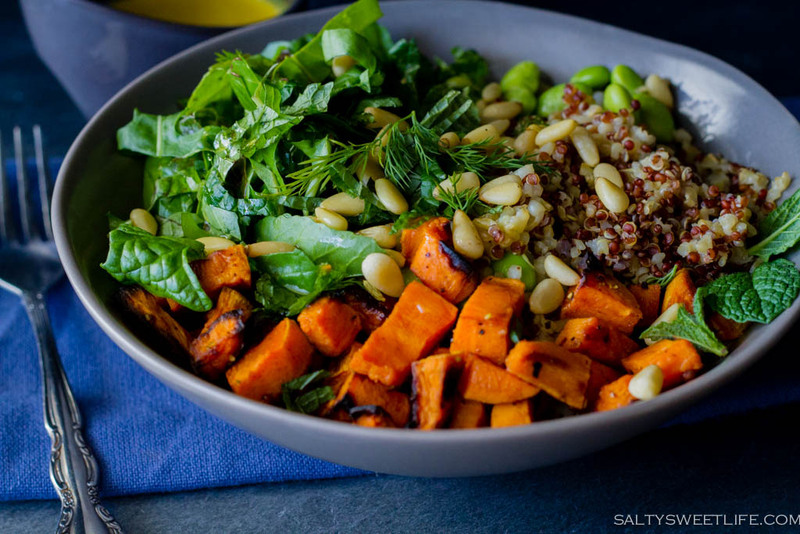 Glad you liked the grain bowl too–so easy and healthy!